"When 900 years old you reach, look as good you will not!" We've got to say, for a 900 year old Jedi master, Yoda has some pretty good looking hands. Of course, he could probably use a manicure, but we're talking about Yoda here! Maybe the greatest Jedi this side of a Skywalker (certainly the shortest!). We can let some dirty nails slide, especially since he's been living in a swamp for longer than most of us have been alive. But now you can have Yoda's beautiful hands too! There's three simple steps to becoming Yoda. First, you've got to talk like him (ahem, "Speak like me, you must."). Second, be green. 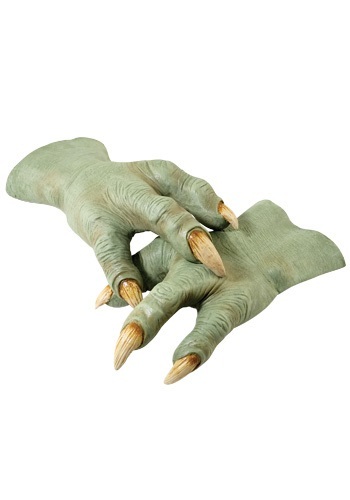 Third, wear these Yoda hands. After that, it's just a simple matter of becoming a Jedi and mastering the force over the course of several hundred years. With these hands, you're basically halfway there. As long as you're wearing them, you'll know the force will be with you, always.